At the beginning of the summer I was relatively unfamiliar with succotash, in fact, I’m not sure I knew how to pronounce it. But it seems to be an “it” dish this summer because I have noticed quite a but of chatter about it lately. Earlier this summer Alaina and I were in Seattle on the hunt for a good restaurant to try for dinner and we came found Ro-Ro’s BBQ and Grill (previously Rowdy Cowgirl) on Stoneway in Wallingford. The BBQ was really good, but the homemade sodas were amazing! They also had a Seattle Succotash with corn, edamame, black-eyed peas, red onion and cilantro. It was good, I loved the way the veggies took center stage. 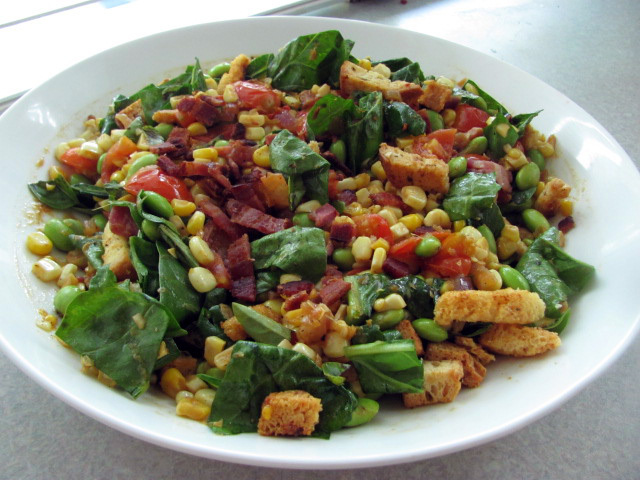 Later this summer Deb from Smitten Kitchen shared a new take on succotash that really caught my attention. So when the cherry tomatoes and corn were both at the peak of freshness at the market I was eager to create my own take on this intriguing side dish. Best decision of the summer. Hands down. Sadly this week the corn was sold out by the time I got to the market today and I was seriously crushed. I think I may have to make a trip out to the farm so I can give this recipe a round two. This is one of those recipes that really isn’t worth the time of day to make out of season. This needs the freshest cherry tomatoes and plumpest corn to make it really sing. Just a bit of heat and the smokiness of bacon bring out the flavors of summer. Oh goodness, I need to find some more corn! In a skillet cook bacon over moderate heat until crisp. Drain bacon on paper towels and crumble. Pour off all but 1 tablespoon bacon fat from skillet and set skillet aside. While the bacon cooks, cut the tomatoes in half, or bite sized pieces. Chop onion and mince garlic. Add oil to bacon fat in skillet and cook onion over moderate heat, stirring, until softened. Add garlic and cook, stirring, 1 minute. Add tomatoes, corn, edamame and vinegar and cook, stirring, until tomatoes just begin to lose their shape. Remove skillet from heat and gently stir in half of bacon, basil and spinach. Mix in croutons. Season with salt and pepper and sprinkled evenly with remaining bacon. This entry was posted in entree, Farm-to-Table, Recipe, side dish, Summer. Bookmark the permalink.